The San Carlos Apache Indian Reservation spans Gila, Graham, and Pinal Counties in southeastern Arizona, roaming over a landscape that ranges from alpine meadows to desert. 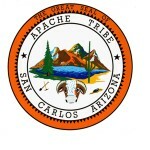 Encompassing 1,834,781 acres, the San Carlos Apache Reservation was established by executive order on November 9, 1871. Over one-third of the community’s land is forested (175,000 acres) or wooded (665,000) acres). Forest lands, with their jumbled topography, create a naturally superior habitat for many wildlife species causing elk, mule deer, turkeys, black bear and mountain lion to be at home on this reservation. A portion of the reservation is contiguous with the largest stand of ponderosa pines in the world. The Apaches are descendent of the Athabascan family who migrated to the Southwest in the 10th century. Over time, many bands of Apache were relocated to the reservation from their traditional homelands, which once extended through Arizona and New Mexico. Currently the largest employer on the reservation is the government which operates many agencies there. In addition to government work, cattle ranching operations contribute approximately $1 million in annual livestock sales. The region is blessed with a variety of geological, historic and recreational attractions. The temperate climate of the Reservation makes hunting for big and small game, such as elk, bighorn sheep, javelina, antelope and migratory birds, enjoyable in every season. The hub of recreational activity is San Carlos Lake. A fisherman’s paradise, it was formed by the construction of Coolidge Dam and is rimmed by 158 miles of shoreline and stores. The lake contains 19,500 acre feet of water, making it the largest body of water in Arizona. Many diverse opportunities exist for the angler on the San Carlos Reservation with both warm water and cold water fisheries available all year round. In addition, more than 100 small ponds, called tanks, dot the area, along with many smaller lakes and streams. Talkalai Lake is fully stocked, and fishing for trout bass, channel, catfish, crappie and bluegill is excellent. Permits are required. More water-based recreation opportunities are available on the Salt River. U.S. 60, the direct route between Show Low and Globe, cuts through the Salt River Canyon which is often referred to as the mini Grand Canyon. Whitewater rafting, kayaking and canoeing are popular sports as the snow melts and runs into the river. The Tribe proudly opened its first Cultural Center September 12, 1995, located in Peridot, Arizona on Highway 70. For the first time, the San Carlos Apaches can tell their own story of their people. A special exhibit, Window on Apache Culture, is housed in the center and describes the Apache’s Spiritual beginnings and ceremonies such as the Changing Women Ceremony. Educational programs and demonstrations are available for schools and other groups. The Tribe operates the Apache Gold Casino which opened in June 1994 with 250 slot machines. Followed by a new Casino that opened in September 1996, with 500 machines, now Apache Gold Casino boast 600 slot machines. Table games are also available. Hotel construction was completed and opened in 1996 with 74 rooms, the Best Western Apache Gold Hotel now offers resort-style rooms.